SATCOM in Rajasthan: Satellite Communication Network (SATCOM) in Rajasthan utilize potentials of Satellite Communication in training and extension activities of line departments, Government of Rajasthan had decided to establish SATCOM in collaboration with Development and Educational Communication Unit (DECU), Indian Space Research Organization (ISRO), Government of India, Ahmedabad. Science and Technology Department is the Nodal Agency for it. For effective utilization and operation a Coordination Committee under Chairmanship of Chief Secretary with Principal Secretaries / Secretaries of various line departments as Members was formed. Under the network. Integrated Uplink Station (HUB) has been established and operational at IGPRS, Jaipur providing connectivity to Edusat, Telemedicine and Gramsat. 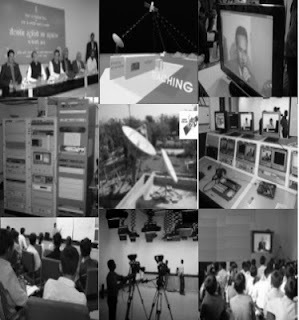 Two way interactive terminals (two way audio and video ) Satellite Interactive Terminals (SIT) have been installed and tested at 32 Zila Parishads. One way video and two way audio, Receive Only Terminals (ROTs) have been installed and operational at all 237 Panchayat Samitis Head Quarters of the State. Ready made programmes of some of line Department are being relayed. A sizable studio at IGPRS is also ready for live telecast. The network will be a widespread communication platform through which centralized lecture facility to remote areas, extension activities and propagation of policies of State Government to common masses. Rajasthan Government plans to extend the ambitious Satellite Communication System (SATCOM) to all village panchayats across the State by establishing Receive Only Terminals (ROTs) linked with the satellite interactive terminals at the district headquarters. The infrastructure will be used for providing information on various public welfare schemes to villagers.